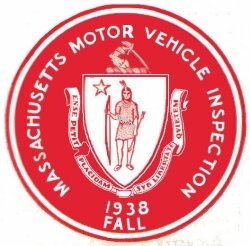 1938 Massachusetts Fall INSPECTION Sticker - $20.00 : Bob Hoyts Classic Inspection Stickers, Add a Final Touch to your Restoration! This is a 1938 Fall Massachusetts INSPECTION Sticker. This sticker has been carefully reproduced from an original in our archives. Personal information can be added to the back of the sticker with a pen or a Sharpie. "These are peel and stick" stickers and they attach to the inside passenger side of the windshield.